Yukon Purple Sweet Potato Gratin, originally uploaded by chrisfreeland2002. I had a surplus of purple potatoes from last week's Purple Potato Soup, so I used them with sliced sweet and Yukon gold potatoes to make a tasty and visually pleasing gratin. I like to add Gruyère to the traditional nutmeg-laced milk sauce for a richer, cheesy flavor. Peel scrubbed potatoes and slice thinly using mandoline. Butter 13x9 baking dish. 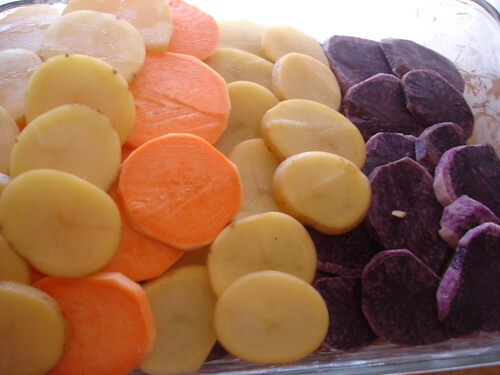 Place potatoes in single layers by color: starting from the bottom, Yukon, Purple, Yukon, Sweet, Yukon. Bring milk, garlic sage, nutmeg, salt & pepper to boil in medium saucepan. Remove from heat and stir in 1 cup grated Gruyère until it melts. Pour over potatoes in dish, cover with aluminum foil, and bake for 50 minutes, until milk is almost evaporated. While the gratin is baking, cut bacon into lardons and cook in medium pan until crisp. Drain on paper towels and reserve. Remove gratin from oven and remove foil. Bring cream to boil in saucepan, pour onto gratin, and sprinkle top with remaining cheese and crispy bacon lardons. Bake uncovered until top is slightly browned, about 20 minutes. A quick blast under the broiler might be needed.